The U.S. senior housing penetration rate has hovered around 10% over the last decade, but there’s been wide variability across different metropolitan areas. It’s difficult to pinpoint why the rate varies so much from city to city, and gaining a greater understanding of what drives penetration has big implications for the industry. Increasing market penetration just a few percentage points would make a big positive impact in terms of overall occupancy in senior housing, influential industry players have pointed out. As of June 2018, the occupied penetration rate for the 99 primary senior housing markets stood at 9.1%, according to data from the National Investment Center for Seniors Housing & Care (NIC). If the overall senior housing penetration rate increased by 70 basis points, to 10.6%, occupancy would hit 95% — a level that has never been achieved for the sector at large. “This is a real opportunity,” Chuck Harry, head of research and analytics at NIC, said last week at the SMASH conference in Chicago. Penetration, as tracked by NIC, is calculated by dividing the total number of senior housing units in a given area with the number of households headed by someone 75 years old or older. It’s a measure of market saturation. Portland, Oregon is the standout market for high penetration. It is highest in the nation both for independent living (IL), at 11.8%, and assisted living (AL), at 10.4%, Harry said. On the other end of the spectrum, New York City has the lowest IL penetration at 1.9%, and Las Vegas has the lowest AL penetration at 2.3%. NIC also has calculated how much penetration rates have increased or declined in large metro areas, and those findings show nearly an even split on the IL side, with about half the markets on an upward trajectory and half going downward in the 2006 to 2016 time period. Denver is at one extreme for independent living, with about a 2 percentage point increase, while Washington, D.C., is on the other end, with a 2.5 percentage point decrease. For assisted living, the split was still fairly even, although more skewed toward increased penetration rates. Minneapolis had the greatest increase, of 3 percentage points, while Atlanta declined the most, at 1.8 percentage points. The penetration rate data is puzzling to industry analysts at NIC and other organizations. “It’s a little perplexing right now that there’s no discernible trend as to what is driving penetration rates in markets,” Harry noted at SMASH. His colleague, NIC Chief Economist Beth Mace, agreed. In an effort to gain more insight into penetration rate patterns, Mace will be leading a panel on the topic at the upcoming NIC annual conference in Chicago. There are some theories about what drives the penetration rate in a given market. By definition, it’s dependent on a city’s demographics and amount of senior living inventory. If the number of older adults notably increases or decreases, or if there’s a senior living building boom or many communities shut their doors, that will affect the ratio of units to age-qualified households. However, penetration is not simply a matter of mathematics, Mace emphasized. Cultural considerations surely come into play as well. “Minneapolis has particularly high penetration, the Pacific Northwest has high penetration, and that could be familiarity with the product,” she noted. This is a point also made by Susannah Myerson, vice president and member of the senior housing finance team within Wells Fargo’s Commercial Real Estate group. Myerson will be on the panel moderated by Mace at NIC. One of these Philly-area operators is the nonprofit Kendal Corp., which is based just outside the city in Kennett Square and has four affiliate life plan communities nearby. However, penetration rates aren’t simply a reflection of a market becoming familiar with the senior living offering and embracing it. This is reflected in the fact that up to 50% of Kendal residents are moving from outside the senior housing community’s primary market areas, Mallon noted. A city’s overall infrastructure is another component to consider, points out Nicole Moberg, chief sales officer at Atlanta-based Thrive Senior Living. Cities like Seattle — which has a high overall penetration rate and has seen an uptick in IL penetration — have been focused on creating infrastructure to help older adults “live freely and move safely,” she said. Yet, having a well-established senior housing market and senior-friendly infrastructure do not necessarily equate to rising penetration rates. Washington, D.C. is trying to position itself on the forefront of the senior-friendly cities movement, having launched an “Age-Friendly D.C.” initiative in 2012. Senior housing as a product is familiar in the D.C. area, which is home to such communities as The Village at Rockville, a CCRC that traces its roots back to 1890, and Ingleside at Rock Creek, another CCRC that has been serving the city for more than 100 years. Despite its mature senior living market and increasingly senior-friendly environs, Washington, D.C. had the biggest drop in independent living penetration and one of the biggest drops in assisted living penetration between 2006 and 2016. The amount of new construction, a city’s demographic makeup, and the maturity of its senior housing market all help explain the penetration rate, but there are still other puzzles. For instance, it stands to reason that a city’s occupancy trends would be in line with its penetration rate trends, but often they are not correlated, Mace said. This was another surprise to her, and another facet of penetration rates that requires further analysis. Driving up penetration rates for the industry as a whole is a desirable goal, as it would signal greater overall acceptance of the product and an expansion of the consumer base. But as individual operators cast their eye over potential markets, a low penetration rate is not necessarily a deterrent. The retail industry provides a good example, she noted. Here, it’s often seen as desirable to have retail clusters to create a “center of gravity” in a given market, even though that puts the various retailers in competition with one another. For senior living operators, a similar principle could apply, although competing in this type of environment would not be suited to every provider. “It depends on the specific operating strategy,” Mace said. Thrive Senior Living is not being deterred by the declining penetration rates in the D.C. area. The company has three communities in that metro market that are “killing it” it in terms of performance, and two more will be coming online in the 12 months, said Moberg. “We love that market,” she said. 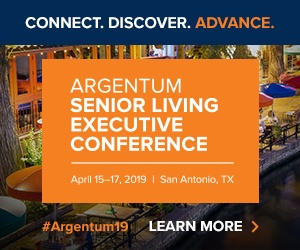 The company has crafted a proactive sales strategy, which Moberg credits for driving occupancy even in markets where the senior living product is having trouble gaining traction, at least according to penetration rate trends. And in fact, it may be that penetration rates are lagging in some areas compared to others not because the senior housing market is immature, but because there’s a proliferation of other options, such as adult day centers, she suggested. For senior living sales success in this environment, it’s crucial for sales people to connect and empathize with the potential customer — typically the adult daughter or son — and follow up with persistence, she said. It appears that an array of variables drive senior living penetration rates, and the overriding factors in one market might not be the most critical in another. If this is true, it may be difficult for the industry to create a strategy for driving up penetration across the board in the near term. But it’s reasonable to expect that penetration rates will rise as the population ages and senior housing continues to expand as an industry, according to a report released earlier this year by Green Street Advisors. By 2025, the penetration rate should reach 12.5% among households aged 80 and older, the report stated. At that point, the penetration rate will likely level out through 2030. Although an improvement from today’s level, 12.5% is still not a particularly high rate, Dan Hutson, chief strategy officer at California-based nonprofit provider HumanGood, told SHN last January. In fact, the industry should be concerned if this is the high point for penetration, he said. A higher rate is achievable, but it will require the development of more thoughtfully designed communities that deliver the type of experience that older adults want, not just what the industry has grown used to providing, Hutson believes. Health care trends might also play a role in driving up penetration rates, Harry noted last week at SMASH. There’s been an overall push to serve more patients in lower-cost settings, and to focus on increasing and maintaining wellness rather than treating acute conditions. Assisted living therefore is gaining more luster in the health care landscape. Penetration rates offer a rich area for further analysis and understanding of the senior housing industry, but they’re also just one data point among many. Owners and operators need to keep this in mind, particularly given uncertainties around the underlying causes of penetration rate trends. “It is so important to look at penetration rates as just one piece of the overall puzzle — along with market occupancy, overall health of a metro area, demographics, and other factors,” Myerson said.